The Crystal wishing tree is a sweeping trend replacing the traditional guest book for your guests to sign. It creates a beautiful focal piece for your room and is adorned in cut glass crystals with ornate votives hanging from the branches to catch the light and reflect beautifully through the crystals themselves. 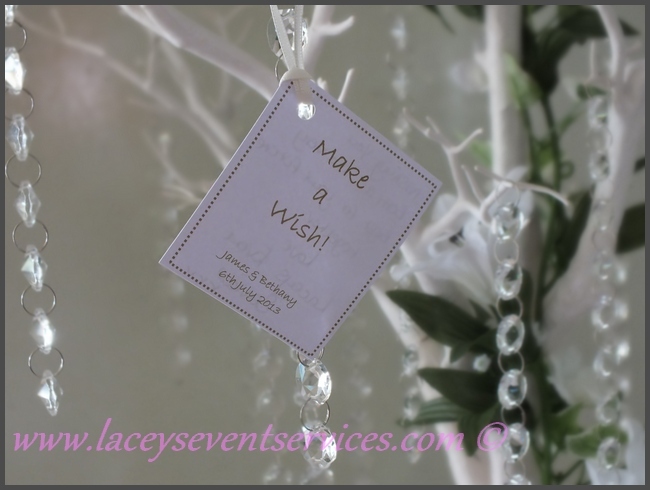 Each tree stands 6ft high and comes complete with 50 personalised wishing tags with colour coordinated ribbons and a keepsake box for you to put your wishes in after your Event. We can also supply a 4ft Manzanita Tree if Preferred. 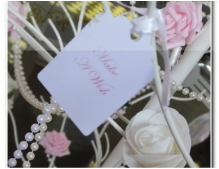 Tags and box are personalised to each client and the event.